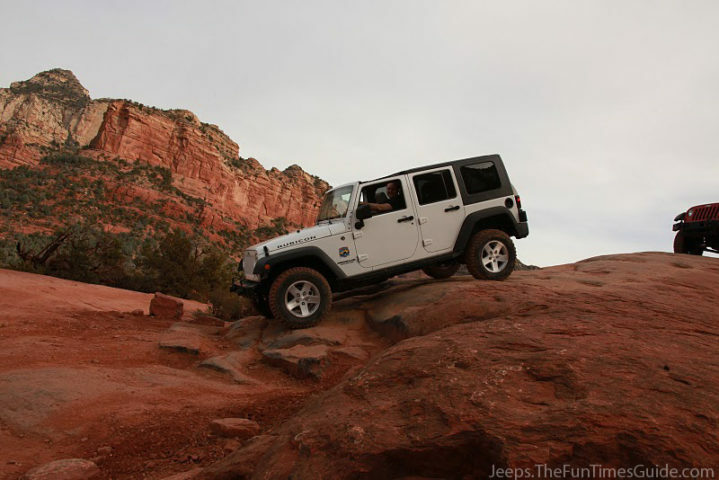 Jim has gone offroading in Sedona, Arizona twice. I’ve been once. Photos from each trip are included here. Both times, we were 4wheeling on the Broken Arrow Trail inside the Coconino National Forest. The Red Rock Country in Sedona, Arizona was named the Most Beautiful Place in America by the USA Weekend’s Annual Travel Report. 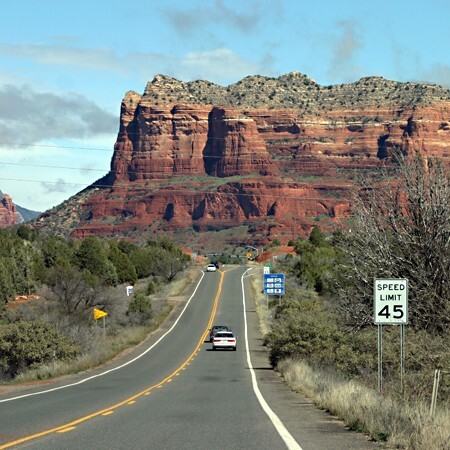 Here we are, entering the most beautiful little city in Arizona… Sedona. This, after our 3AM departure from the Phoenix hotel. Followed by a far-too-many-hours-long drive north to the Grand Canyon (in the snow). But it was well worth it! Sedona is amazing. After being slightly let down by the first 3 (or lack thereof) in the Phoenix area on Day One, we were delighted to find that Sedona had last 2 covered! Jim had chatted with Nena several times before regarding her Jeep website and her article about Jeep Tours that appears here on our Jeep site. But they never really “met” until now! She works in partnership with Farabee’s Jeep Rentals (now Barlow Jeep Rentals) which is where we began our off-road adventure with her on this day. This was our first time offroading so far off the beaten path. We’ve done our share of trail rides, water crossings and unmarked roads… but to this point, we had never tried offroading on limestone slickrock with cliffs, valleys and drop-offs in every direction! 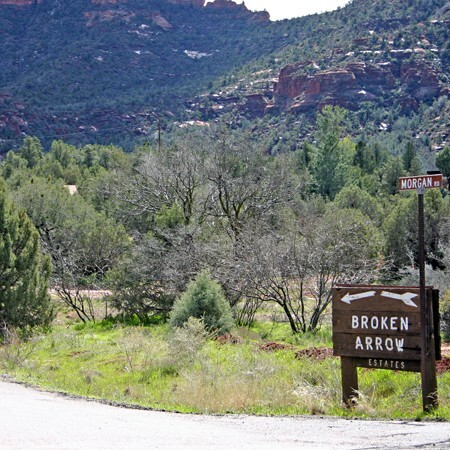 The Broken Arrow Trail itself is named after the 1950 Jimmy Stewart movie — which was filmed at this location. Nena played tour guide to 2 completely entranced tourists (me and Jim) who were in awe of every single thing along the way. From the sheer beauty of the Red Rock that surrounded us in the Coconino National Forest… to the slick mountain rock that our Jeep managed to climb with ease… to the magnitude of nature and all that is natural. Pssst… Jim was excited to learn that Ephedra (which has been banned in this country) grows naturally along the Broken Arrow Trail in Sedona. Thus, a return visit is definitely in order! It takes about 2 hours to do the Broken Arrow Trail… give or take. We stopped many times along the way to take pictures and take in the view. 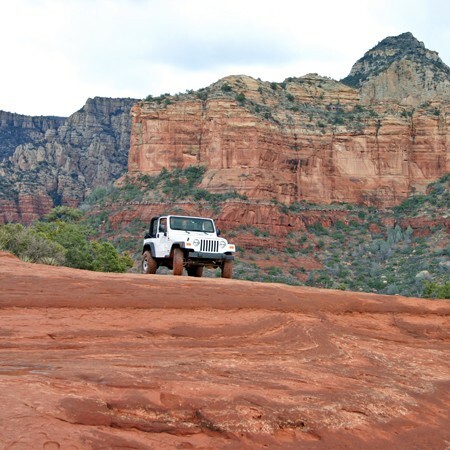 There are about a dozen off-road trails for you to choose from in Sedona. This was one of the milder ones. 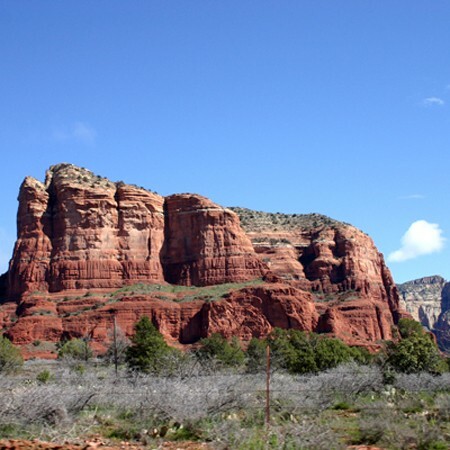 Perhaps the tamest of them all is Schnebly Hill — named after the town’s earliest pioneers and future namesake: Carl Schnebly and his wife, Sedona. We were definitely not alone out there!… There were literally dozens of other Jeepers enjoying the Broken Arrow Trail. Nena said that many of them were hoping to take advantage of a rare rain-shower on the rocks — 4-wheeling takes on a whole new feel when those rocks are wet! She also said that they so rarely get rain in Sedona that they are in awe of most mud puddles and sights of trickling water running down the Red Rock. (How privileged are we to have seen both on this one trip?!) In fact, they say that the sun shines over 300 days a year in Sedona. (That’s more than Florida!) How is it that the one time we venture to the desert, it rains most of the time that we’re there?! We lucked out though — the skies always cleared when we were participating in outdoor activities. We encountered various sorts of terrain along the way. This may not be the best example, but there were a few spots along the trail that required some fairly tricky maneuvering. Like the highlight of the trip for us — known as “the Devil’s staircase” — which is a somewhat steep and narrow pass between rocks on your right… and on your left… and down the middle. What really makes it a “staircase” is the fact that you have to inch your Jeep down a long stretch of rock ledges — the entire length of the hill. Way cool! A sunshiney yellow Jeep on top of some of the biggest rocks we saw… from a distance. The Broken Arrow “trail” consisted of pure mountain slickrock… as in “red rock” limestone formations. Our 2-hour drive consisted of more rock-climbing than trail riding — from what we are used to anyway — here in Tennessee. Add to that the narrow passes and steep drop-offs, and we had ourselves one fun little adventure trip! AND… did I mention it was misty and raining part of the time? 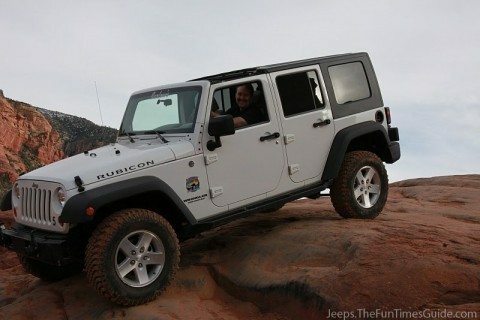 How those 4 little tires on our Jeep kept us upright, I’ll never understand. I’m serious, it’s a feeling that you have to experience yourself. There are actually 3 Jeeps on the rocks in the distance… A yellow one to the left, a yellow one to the right, and a Pink Jeep partially hidden by the trees in the center. Nena snapped our picture amidst the beautiful Sedona Red Rocks. Nena is pointing out some of the “named” rock formations. She told us lots of funny stories about how various rocks got their names. I wish I could remember them all. I was taking it all in from the backseat — with camera in hand. Here Jim stepped out of the Jeep to snap my photo real quick. We Finally Spotted Some Cacti! On our mission to find the ever-so-tall, prickly, forked cactus… we were delighted to spot fields and fields of them! We saw the most along the road between Sedona and Phoenix. A few more of our photos from this trip on the Broken Arrow Trail. This is the crew for Terry McMillen’s NHRA Top Fuel car (left to right): Austin, Doug, Tad, Terry, and Phil. Also seen here: Nena (owner of Barlow Jeep Rentals). Not pictured in this photo: Jim (he was behind the camera). The guys from the race team were enjoying a day off before the Phoenix NHRA race. Jim was taking all the pictures. Here, Doug is behind the wheel with Austin and Phil looking on. 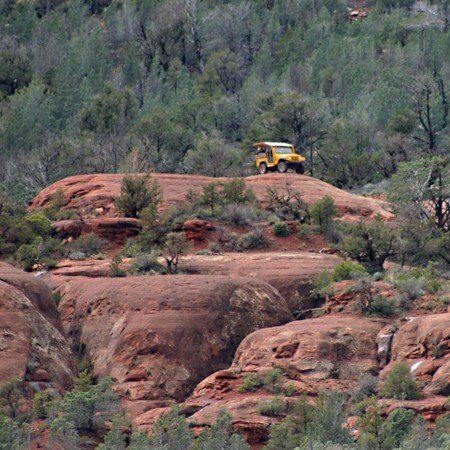 Here, Tad is behind the wheel on the Broken Arrow Trail in Sedona. 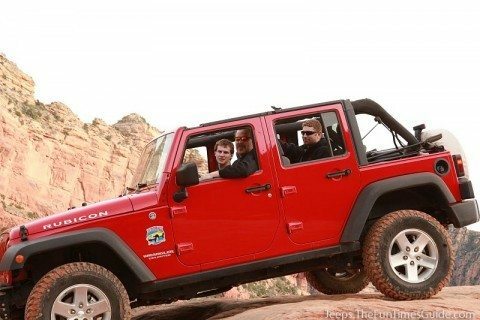 The guys are having a great time 4wheeling for the first time together.